Shake this fresh-scented powder into your hair to absorb oil and look clean on-the-go. Your purse is a conclave of secret weapons: Lint roller, mints, lip balm. Complete the beauty stash with this all-natural dry shampoo. A major time-saver on busy mornings or post gym dinner dates, shake the fresh-scented powder into your hair to absorb oil and look like you had those extra thirty minutes to blow dry. 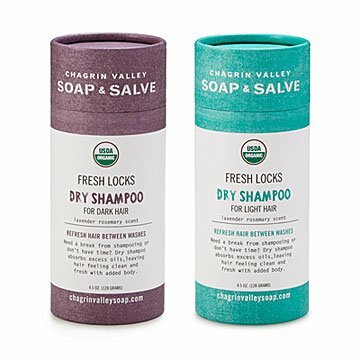 Conventional dry shampoos have ingredients we can't pronounce (distearyldimnium? ), so we hunted high and low for this chemical-free, great-smelling version of an on-the-go staple. The nifty design is made for light or dark hair—the dark hair variant has a subtle, natural tint (so your roots don't look powder-sugared). Handmade by Ida Friedman Kasdan in Solon, Ohio.